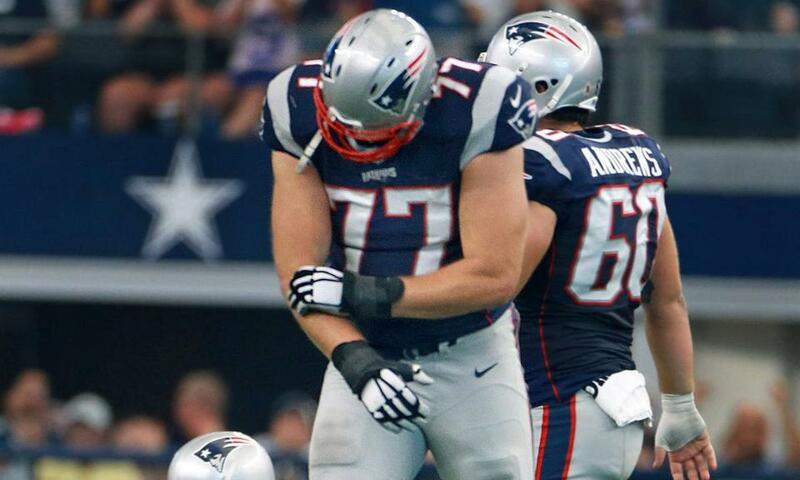 Patriots offensive lineman Nate Solder grabs his right arm after a second-quarter play Sunday. FOXBOROUGH — The Patriots’ offense was dealt a serious blow Wednesday when it was revealed that starting left tackle Nate Solder will be lost for the rest of the 2015-16 campaign. According to a team source, Solder will require season-ending surgery for a torn right biceps suffered late in the first half of Sunday’s 30-6 victory over the Cowboys in Arlington, Texas. Solder walked the sideline on his own after the play and didn’t appear to be in great pain. Following the game, Solder downplayed the injury and indicated to reporters he thought he might be going back into the game. “Yeah, that was a call they made and we’re just going to roll forward and see what happens,’’ the 6-foot-8-inch, 325-pound Solder said before exiting the locker room with an ice pack on his arm. Solder, who signed a two-year contract extension worth just over $20 million in September, and the rest of the offensive line struggled early against the Cowboys as Tom Brady was sacked five times for 28 yards in the first half. 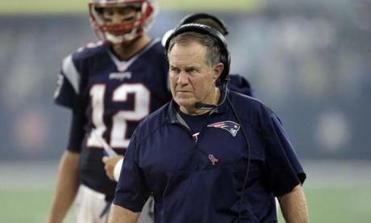 The Patriots coach wasn’t interested in talking about the revenge factor in Sunday’s game vs. the Colts. Solder was injured while blocking Dallas’ Tyrone Crawford. As Solder engaged Crawford, the defensive tackle angled to Solder’s right and appeared to tug on his arm before shoving him, breaking free, and sacking Brady. Solder immediately grabbed his arm and headed to the sideline. Solder has been very durable since New England took him with its first draft pick in 2011 (17th overall). He has missed just one game (in 2013, because of a head injury) over that time. He took over protecting Brady’s blindside in 2012 after longtime left tackle Matt Light retired. Marcus Cannon, who filled in admirably and played the entire second half in Dallas, when the Patriots yielded zero sacks, is the logical candidate to replace Solder, who lauded Cannon for his performance against the Cowboys. The Patriots also have the option of moving right tackle Sebastian Vollmer over to the left side. Vollmer did play there his rookie season, including five starts. The Patriots placed Solder on injured reserve Wednesday and claimed defensive back Rashaan Melvin off waivers from the Ravens to fill his roster spot. As for adding depth on the line, the team has three offensive linemen on the practice squad, including tackles Cameron Fleming (who was practice squad player of the week last week) and Blaine Clausell, and guard Chris Barker. Cannon, who has rotated in regularly at both tackle spots this season and has some experience at guard as well, said the “next man up’’ mentality is a must in football. Whether you’re a starter or the last player on the depth chart, you have to be ready when you’re summoned. Coach Bill Belichick said Cannon’s versatility has made him a big asset along an ever-shifting offensive line. New England has used 11 different combinations this season, tied for tops in the league. Belichick said the fact that Cannon had played so often this season was a big reason he was able to step in and help neutralize the Dallas pass rush. Earlier in the week, offensive coordinator Josh McDaniels talked about how impressed he was with Cannon’s performance in Dallas. His next opportunity comes Sunday night in Indianapolis. Jim McBride can reached at james.mcbride@globe.com. Follow him on Twitter @globejimmcbride.